Jerk! hands off the baby birbs! The Facebookers are really good at catching and sharing events at the nest. The cam was down for a while and then there were reports of a strange eagle birb attacking the nest. This happened tonight, male-on-male attack. Like a boss. I guess eagle numbers are up so prime real estate is in demand? We're seeing an eagle around the homestead. He must be setup on a small lake. The FB page is now of the opinion that the female hasn't been seen in a while, and it's possible she is injured. The male has been calling out to no avail, and there was another breech of security this morning as the attacking eagle showed up again. Maybe she's hooking up with the attacking bald eagle and put him up to it. Just like Kathleen Turner in Body Heat. The female isn't returning, and now the snow arrives... it looks very grim for the nest the eggs won't stay viable, and even if the male manages to keep them, the igg-lets won't stay alive with just one parent minding them. While the Game Commission does not have a biologist on the ground in the area, it does appear that there may be another adult eagle around the nest. "Extra" bald eagles may be adults that have not yet paired up and claimed a territory; they may attempt to interfere with this pair in order to claim a mate or territory. With the population filling the available habitat in many parts of Pennsylvania, it would not be surprising to see some increase in nest failure as a result of these interferences and competition disrupting the care of nest and young. The big take-away lesson, bald eagles are well-adapted to Pennsylvania. They are well-adapted at selecting nest sites, building nests, and caring for eggs and young. This is one of the great lessons of the Game Commission’s bald eagle recovery effort and its annual monitoring of active eagle nests. As bald eagles are filling available habitat in some parts of the state, there will be some conflicts between competing eagles. We have never in modern history been witness to such conflict events and we will all learn as we go. In most conceivable circumstances, nature will be allowed to take its course without intervention. 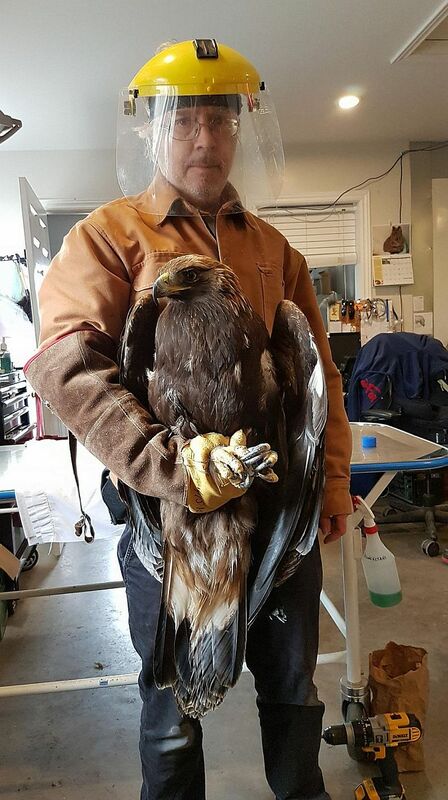 Should an injured eagle end up grounded, the Game Commission could facilitate it’s transfer to a licensed rehabilitation facility. I just want to say, how amazing that is. The attack tells us that the eagle population has now recovered to the point where adults are fighting for their space. 20 years ago there weren't many of them in the area, and the spotting of a nesting pair was a big deal. So this is great news. It means the water has enough fish and the forest has enough wildlife for them to prey upon. Oh this is sad news. I tuned in yesterday and the nest was empty - just the two eggs sitting there in the cold. Those eggs. Under a bunch of snow now. What happened is the female did not return at all, which suggests that she might have been injured in the attacks. The male incubated for a while on his own, but without the female, it won't work... he has to leave regularly to hunt. Yesterday he left for an hour and that was that. Snow covered the eggs, and they are done for. The birb you are seeing there is the attacker lady birb. But sometimes the male seems to return instinctively from time to time, just to see if his woman has come back. Apparently, even if he does take up with the homewrecker, which may happen - It's too late in the season to start over with new eggs. Apparently the lady birb is bringing sticks to the nest to entice the male into a new pairing. The FB folks say that the previous female has been on this nest since 2004 with three different mates. She raised many chicks over the years but she is a senior birb and her time may be over. So I was on the 86 / 17 exchange, kamikaze curve in the vernacular, and three bald eagles appear. One circling lower while 2 and 3 appeared to be in a scrap. 2 was trying to sink talons into 3s back. I chose not to crash by following the action. It could have been foreplay but the 3rd bird makes me think it was a drama like Hanover. Just a BIT of excitement today at CWRC. A golden eagle! He was rescued from the ocean off Cape Sable Island by lobster fishers who saved his life. He's in surprisingly good shape, doesn't appear broken and does not have lead. We think he's just exhausted but we'll be xraying him and running more tests in the next couple of days. Sheffield University Peregrine Falcon nest webcams. I had hoped to be able to see the local Peregines on the Bucks County Council tower block in Aylesbury again this year. However, due to some technical embuggerance or other, the webcams up there aren't working. Something of a disappointment, to say the least.